In addition to my usual work on things like Plasma, I've been hacking away on bugs that pose barriers to the use of the Korean language and writing system in KDE/Qt systems lately (I took up studying Korean as a new hobby). As a bonus, many fixes also tend to help out users of other CJK (Chinese, Japanese, Korean) languages, or even generally of languages other than English. 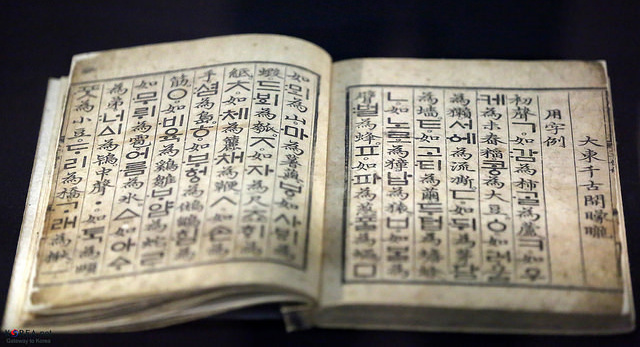 On Linux systems using IBus for complex writing system input (which is most of our desktops), Qt 5 would generate QInputMethodEvents with badly-formed formatting directives, causing pre-edit text (such as incomplete Hangul blocks) to turn invisible in some applications. This fixes text entry in Korean and any other language doing complex in-line composition in KWrite/Kate, KDevelop and other applications built on KDE's KTextEditor framework (and likely others). A fun mess where a chain of QString::arg() calls against a template string would go awry by replacing a URL with percent-encoded Korean into the template, causing subsequent calls to trip up on unexpected % placeholders. Your Korean podcasts will now work nicely again in Amarok. Code page 949 is a superset of the EUC-KR character encoding. Introduced by Microsoft, it supports additional Korean characters not supported by EUC-KR and remains in use on some Korean websites and IRC networks (unfortunately - please switch to UTF-8!). QTextCodec gained support for CP949 in the Qt 4.x series, but our KCharsets was never sync'ed up to those enhancements, hiding the codec from selection UIs throughout KDE's products. The effective impact of this is reduced somewhat by Qt 5's support for ICU, which is smart enough to handle CP949 transparently in EUC-KR mode, but the situation was still confusing for users nonetheless (and left broken when running non-ICU builds of Qt). This last one is interesting because patches to address this were actually supplied by the community in 2010 already, but they sat around unloved until recently despite not being very complicated - developers are often reluctant to engage in tickets like this because they feel out of their depth, or simply struggle with the setup necessary to reproduce a problem. I worry this may cause a bad feedback cycle of bugs not being reported by users who don't have the time or energy to educate developers about the problem space. If you're a user of Korean (or other CJK languages) and KDE, please do report them. I'll be keeping an eye out. If you're a developer and struggling with Korean or CJK support in your application, you should consider getting in touch, too. Kool! I appreciate for your jobs. KDE users in Korea are loving this supports. Most of F/OSS people in Korea didn't recognize how KDE project huge in the world. But it's too huge to support few Korean users. And the CJK input system supports are helpful not only Korean but also foreign Korean users. It'll be good point to expand KDE in Korea, China and Japan. Thanks for your works. I'll try to support your jobs. Tx for all the information. I am sorry, but I still don't get how I can type Korean in Kate. Anybody care to explain how to do it?